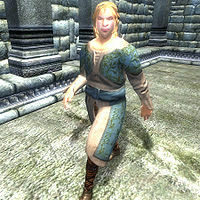 Gundlar, a Nord commoner, is Duke Thadon's personal cook. During the Ritual of Mania quest he will unknowingly serve Thadon a meal injected with a lethal dose of Greenmote. Thadon's passion for drugs and aphrodisiacs supposedly keeps him quite distracted from common foodstuffs, and Gundlar can enjoy a lifestyle that is hardly back-breaking. After waking up early at 6am, he wanders around the throne room in the House of Mania for three hours before heading to the Duke's Quarter's kitchen to prepare a meal for his Lord using a mortar & pestle. The task occupies him till midday, leaving the prepared meal on the table. 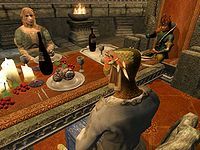 He seems to do the job quite well as Wide-Eye will remark "Gundlar is quite a chef and prepares Thadon's meals personally, adding just a hint of Greenmote." After four hours of pacing in the throne hall, he will take a break outside and stroll through the Halcyon Conservatory until 7pm. At this point, he travels to the kitchen, takes the meal and then joins the Duke and Wide-Eye for dinner in the throne room, personally serving the meal to Thadon. He spends the next three hours simply chatting, however, having apparently lost his appetite. After loitering around for a couple of hours, he will retire to his quarters at midnight for a good night's sleep. The only change to this routine is during the Ritual of Mania quest: at 7pm he will serve dinner as usual and relocate to the throne room, where he will feast together with the Duke, continuing undeterred once Thadon delivers his peculiar soliloquy. Once he starts having convulsions, however, he will stand up and look on as his Lord dies. As the Duke utters his last breath, Gundlar will happily start cheering and will joyfully tell you: "There's no need to mourn. The Ritual has begun! Be happy!" Once you extract the blood, he will return to his usual schedule and will now greet you with "Your Grace, you honor us with your presence." His lowly status as court cook means he can only afford a brown tunic, tan linens and a pair of orange loafers. He also carries the key to the House, a cheese wheel and his mortar & pestle. Although he doesn't have a very unique greeting, when exiting conversation he will proclaim: "May all your days be filled with enlightenment and mirth!" If you ask him about the chalice of reversal during the related quest, he will wash his hands of it: "Not my place to talk about it. You need to know, you talk to Wide-Eye." How awful. An adventurer trying to get into our fine land? I hope they stay far from the palace. Oh my! The Gatekeeper is dead! I must hurry back to Thadon's side. He must be protected! Oh thank goodness! The Resonator of Judgment has saved us! I'm so relieved that the Chalice is back in Lord Thadon's capable hands. He seems to be himself again. Syl has tortured her courtiers again, I hear. Poor things. When I heard the Great Torch atop the Sacellum was ignited, I literally jumped for joy. It's nice to feel safe for a change. The Ritual is completed, and a new ruler presides over Dementia. My master has partaken of the Greenmote and passed his post onto another. Now a new rule begins in the House of Mania. I've heard The Fringe has been attacked. I hope the residents were able to escape in time. Between the Gatekeeper and the Resonator of Judgment, I feel much safer in New Sheoth right now. Lord Sheogorath's mood seems improved now that he has an army at his back. Sheogorath may be gone, but I will still serve the House of Mania until my death. The Greymarch is complete and the House of Mania still stands tall. Gundlar was supposed to eat in the throne room between 7pm and 10pm, but because his AI package is "Find" rather than "Eat", he will simply sit there without actually eating. This page was last modified on 20 October 2015, at 06:33.